A natural herbal concentrate for the stimulation of nervous system function and mobilisation of energy within the organism. In the Energyvet Pentagram scheme, this product works on the borderline between the elements of Earth and Metal. It influences the nervous system, the stomach and it is effective for stress. The product exhibits stimulating effects only on those centres of the nervous system which are weakened. These are, most often, the control – depressant brain, spinal cord and autonomous nervous system centres. For this reason the product increases the animal’s ability to concentrate and calms the animal down. During fatigue, it in turn exhibits a stimulating effect through the enhancement of activity of the weakened activation centres. It also stimulates the formation and release of energy reserves in the body. The product increases endurance and perseverance of the animal. Bioinformation of the product-specific homeopathic type complements and potentiates the effect of the included herbs. - Viral conditions affecting the respiratory tract (sneezing stage) in springtime [Imunovet]. - The endurance of the animal (for training and preparation for performance) [Skelevet]. - Enhances muscle work and speed during fatigue (physical as well as mental) [Fytovet]. - Nerve fibre recovery and growth. Nerve cell interconnections [Omegavet]. - Enhances storing in permanent memory [Omegavet]. - Excessive production of gastric juices [Skelevet, Cytovet]. - Enhanced effect of other concentrates upon the animal's mental condition [any Pentagram product]. - Enhanced immunity against emotional, mental influences [Fytovet]. - Calms down hyperactive and distracted animals [Fytovet]. - Excessive care of the mother for the young, already symptomatic false gestation [Skelevet]. In respiratory viral conditions it is possible to use the product for as many as 6 times per day for the maximum period of 3 days. Shake well before use! For precise targeting of the regenerative process it is recommended to seek professional advice. It is recommended to use the product within three months of opening. Do not administer in cases of advanced lung inflammations (with coughing), severe colon and skin inflammations. Do not exceed the recommended daily dose! Ensure sufficient intake of water in the course of product usage. Not suitable for gestating females. Keep out of reach of children! Store the product in dry and dark environment, at 10-25°C. Do not freeze. Minimum shelf-life specified on the box and label. 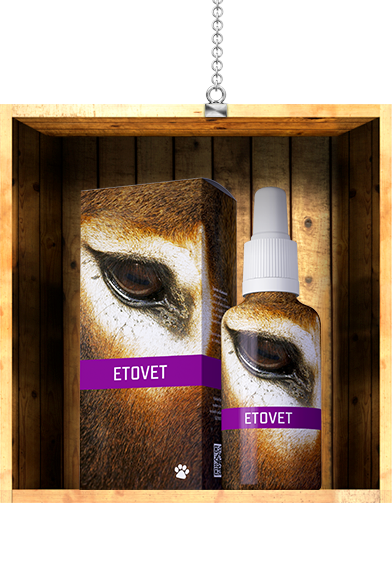 I use Etovet for behaviour disorders in cats and dogs; for epileptiform spasms and restlessness in combination with Fytovet. In the treatment of hypothyroidism in combination with classical medication, Gynevet and Fytovet. Good results are achieved in the application of Etovet during false gestation in females. The effect is apparent also in parrots who often suffer from the feather-plucking syndrome.